Hey fashionistas and nistos! A couple of weeks ago I attended an event called “Fashion Speaks Friday” and the topic was about fashion in the digital age. But that will be for another post. Some people showed all dressed up, others were more on the casual side like myself. The cool contrast 2B Bebe sweater which I haven’t worn in years was cooped up in storage and I forgot all about it. 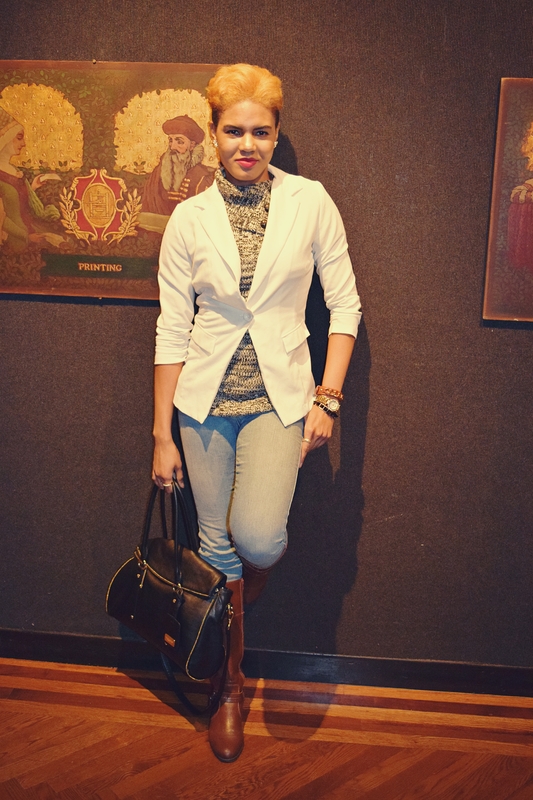 I layered it with a white 2Cute blazer and paired it with Guess jeans and earthy tone Naturalizer calf boots. This is my “go to” Armani Exchange satchel bag. It goes and compliments everything I wear. I wanted something casual and comfortable but still sustained a structured look. Oh yeah , the sweater has these cute little pockets for hidden treats. Thank you for reading!